Traditionally I do a post immediately after flying. 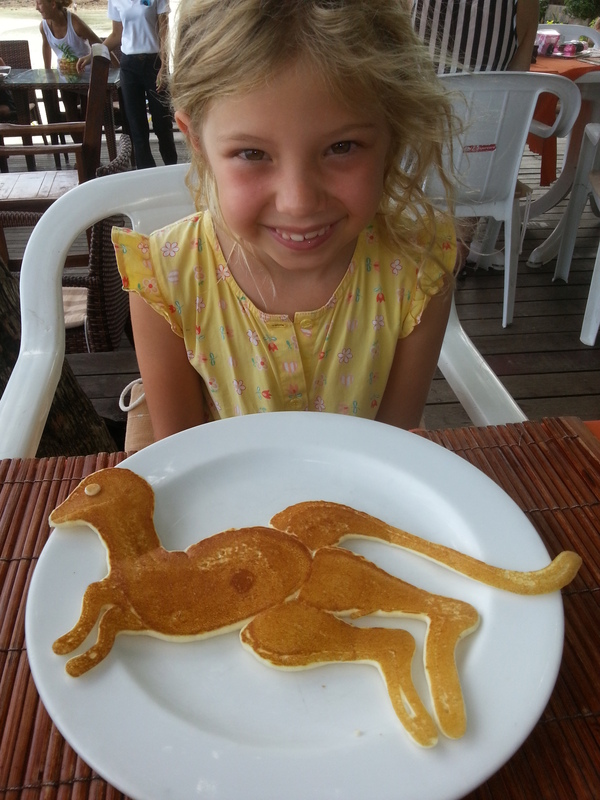 The day started with a dinosaur. Then we had to leave this child friendly place. Again, I could not find a decent family room. Asia just is not child friendly money wise for hotels. The hotel we are in now wants 20$ for an additional bed. A scam. Anyway, we took a taxi. Then a catamaran speedboat. Astrid started to look pale. It really was a scary ride. I have a video, the pic here does not really look scary, I know. We were 30 minutes behind schedule. Given that there were only 25 minutes planned to board the plane it did not look good. The bus started fast and we were only 15 late at the airport. And loo and behold, checkin, 2 security checks and boarding can be done in 10 minutes. 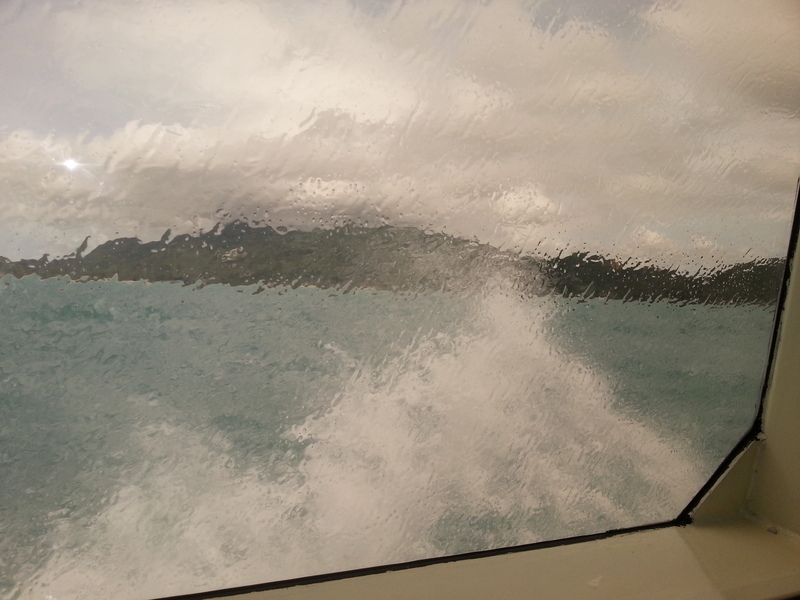 Note: a flight to Ko Samui is about double the price compared to our speedboat-bus-flight combo with nokair. A strange thing. Rather than getting used to it Astrid gets rather more afraid from flying. And I am as nervous as ever. Besides that, nokair was good. This post has nothing to do with Salad. Rather with Salad Beach Resort. Bloated. These things are big. 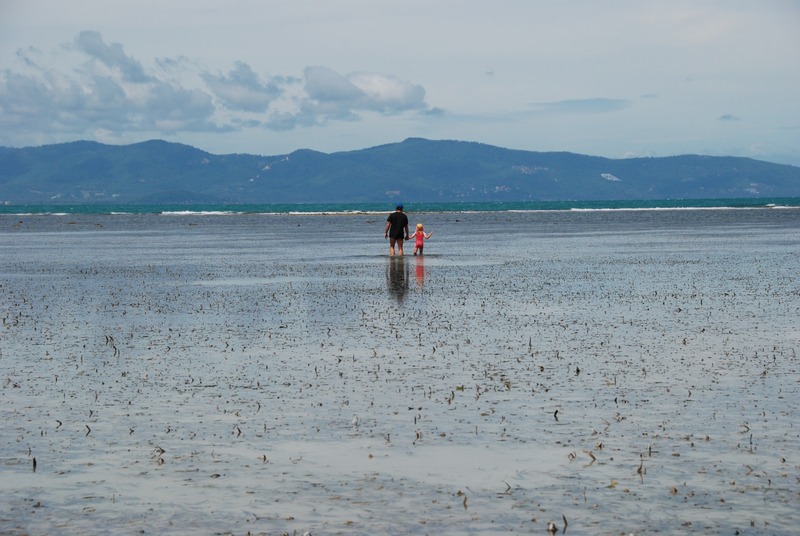 We moved to Haad Salad, still on Koh Phangan into the Salad Beach Resort. A place full of kids and we have nothing to complain about (with the exception of WiFi). Basically everything is better, the room much superior and yet, including breakfast here, only half the price. The beach is good and we can go snorkeling directly form the beach. Visibility is limited though. 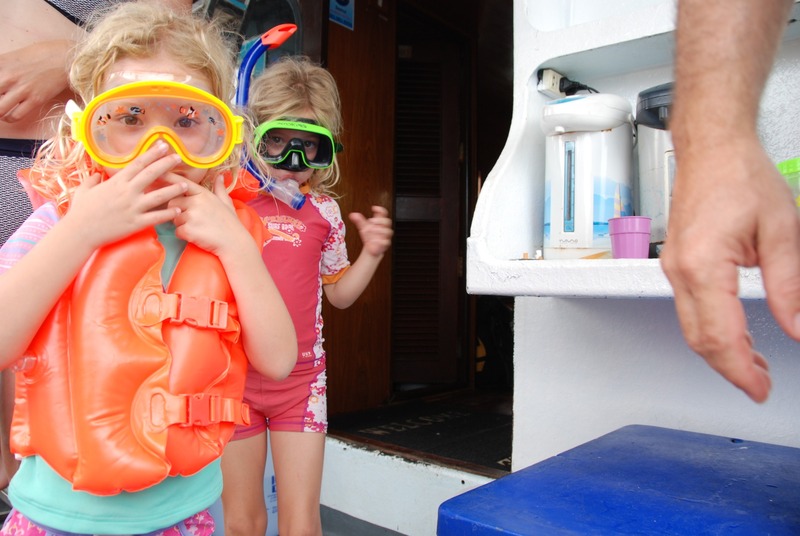 We went onto a diving/snorkeling trip to the Ang Thong National Marine Park. Well, the tip was mostly for the divers and snorkeling was somewhat difficult with the kids, the water deep and waves. 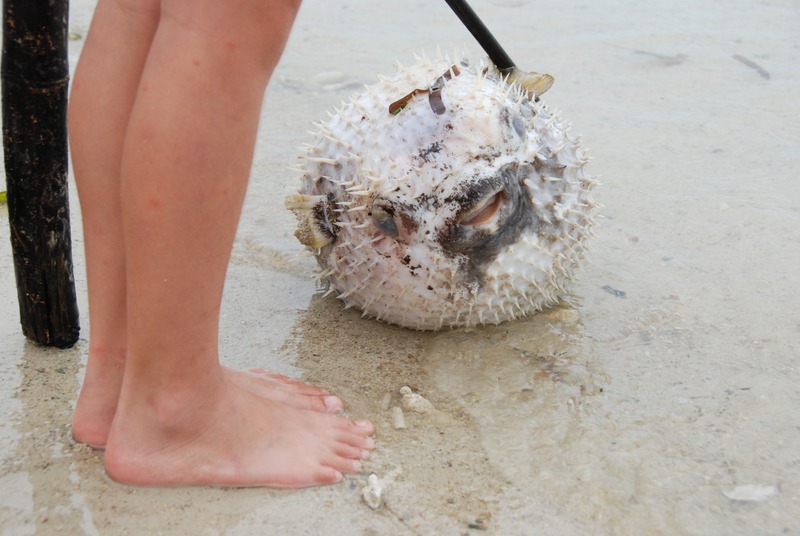 Should have taken a local “snorkeling only” tip instead. But Lena nonetheless now figured out how to see all the fish we were talking about. She does not use a snorkel yet, but till stays below the surface for about 80% of the time. We do nothing most of the time. That is also why I do not have the time to write the blog or catch up with other work. If you do nothing you do not have the time to do anything. Now, the ticker is complete concerning the travel. Back in Switzerland, Zürich Airport 26.07, 19:00. Why that date? Well, if someone asks how long our trip was, we can say: “More than a year”. If you excuse me now, got nothing to do. We are now one island further Ko Pha Ngan in a place called Power Beach Resort. From now on every travel we’ll do will bring us closer home. After the moment I booked the flight home to Zürich in Bangkok some days ago, it really dawned on us that our adventure will soon be over. And there still is a lot to do. But I guess no one will pity us. We are currently doing nothing. Just some work like doing this blog or sorting pictures. The days just fly by. Now to the theme of this blog. Some people asked me to describe how we travel and give some tips on how to do. What happened to us recently can serve as a starting point. I might make a special page just on such themes, how to book flights and hotels, especially with children. You get what you pay for really is true. If something seems to be too cheap it usually is not good. If something was expensive it usually was comparatively good. Value for Money. You need to do a reasonably check. After a short time in a country usually the price level becomes clear. We were quite proud so far that we never really got cheated in Asia. Ok, we paid 10$ for a towel worth probably 3$ and stuff like that, but never for much money. Occasionally we were tired of haggling and thought 10$ makes them happier than us. In many countries this is a problem. This might reduce the answer set to 0. At some places it gives you 2 Rooms as answers but that does not always work. We found out that many hotels actually have family rooms or rooms with 2 double but do not have it on the internet. Most hotels in Asia have a double and a single! If you can live with that with 2 Kids you are fine. Almost all hotels have a “free if using existing bedding below 12 policy”. Otherwise you have a problem we also could not solve. If a policy says: “Kids above 6 are considered adults”, boycott them. Note: In Canada and USA you are fine, because all hotels have 2 double beds with kids staying free. If not, skip them. Now a sanity check. If your 4 people room is more then double the price of a 2 people room, then there is a good chance your hotel will not deliver the proper level for the price! Exceptions: the room is a suite with a kitchenette and the other rooms are much simpler. Note: some steps get repeated or order might change, this is just a guideline. Now, agoda.com. I do not like them, because you cannot search for 2 Adults 2 Kids (you can set it but this does not influence the search result) and because they have hidden costs. Booking.com is almost always all inclusive (i.e. taxes, service-charge) while agoda has them separately. Also the additional child bed charge you only see at the very end and some hotel charge almost more for that extra bed than for the room. So you end up paying double as a couple would and have a crowded room. 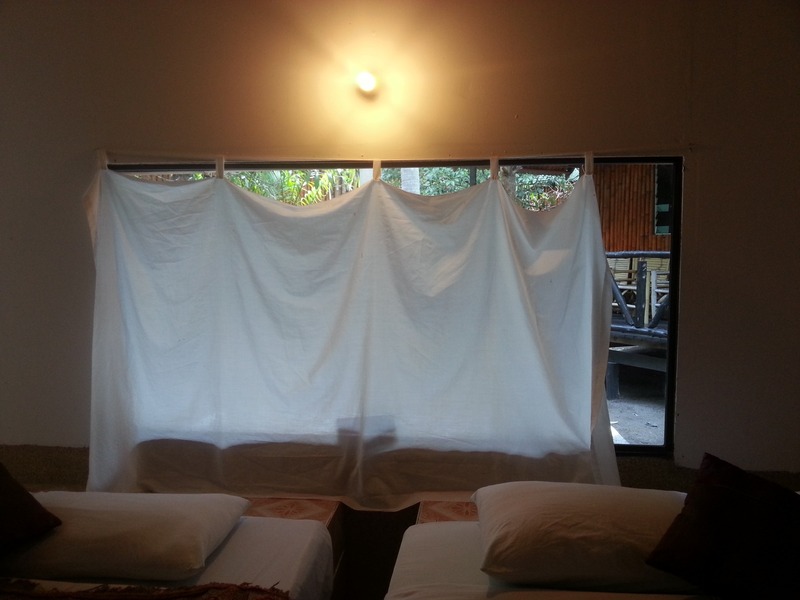 Also at agoda you do not see the actual bed size. Very important with kids. Agoda has much more hotels, so occasionally I used them. You can also use Tripadviser but they will direct you to other sites and you cannot search for kids. Was of no much use for me. In Bangkok a tuk-tuk driver wanted to show us the 5 usual monuments for just 40 Baht (1.2$). This is impossible. Such a trip should cost at least 3$. So too good to be true. We took it anyway and decided to be on our guard. However, he really showed us the promised sites and then asked us if we wanted to see the official government jewelry promotion selling place (forgot name). He told us, he’ll get free gasoline if he brings tourists there. Well, a honest man. OK, why not. What happened there, Astrid has to tell you in person, but all was OK. Anyway, we then saw another place and then just wanted to have one of those nice maps he had of Bangkok. So he brought us to an “Tourist Information”. 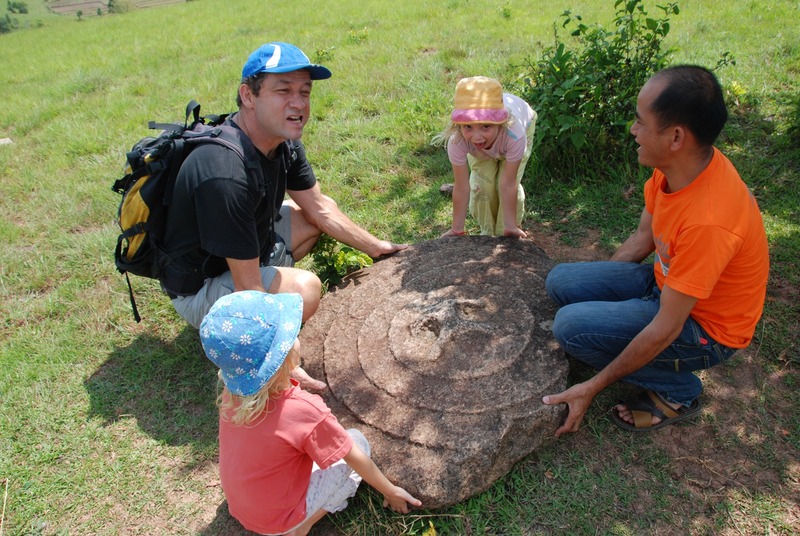 For people not used to travel in this parts of the world: A Tourist Information is simply a travel agency. We knew that of course by now. A nice guy named Cris of Vancouver Canada (if true) gave us a map for 1$ and gave us a lot of tips about travelling in Thailand. 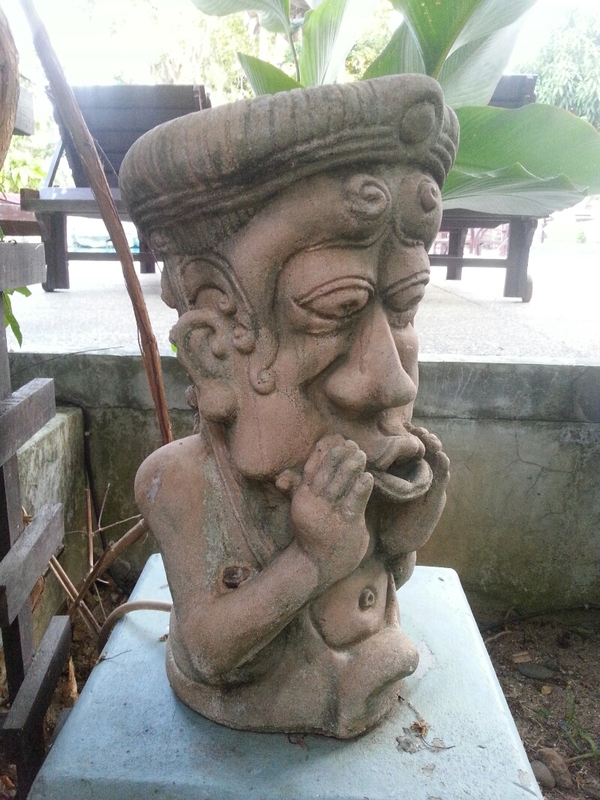 He also knew of the problem of booking hotels for families so he proposed us a fancy resort on Koh Phangan. Very expensive but right by the beach, and the pictures looked really nice. So we decided to indulge in luxury and booked it. Without checking. Something I always did so far. OK, I had not yet mobile internet, but I should simply have asked him for the agoda score and looked myself. So we arrived on Koh Phangan and even were picked up for free by not less then 4 employees. We really payed a lot for it. That room was worth about 1/3 of what we payed for. We then got another room with an extra mattress, somewhat better but still worth only a fraction. Now we checked. The agency was difficult to find (on TripAdvisor) because they change name frequently. I had to use the street address and the name on the credit card bill. Sure as hell, full of warnings. Also for the Hotel on Agoda and Booking.com, tripadviser, ratings below zero. Never saw such a bad review. for every available room type. The resort has about 90 Bungalows. We only rarely see other guests. No kidding: I think at the moment only 2 Bungalows are occupied. That place even is somewhat eerie, big but no one around. So much for Agoda. Booking.com has it at 6, about as low as it gets. More useful then Agoda again. So we got cheated, we even booked 5 days, and paid luckily not much more then we would have to pay on Agoda. The place is completely strange. Actually only the rooms are enormously overcharged. The rest would be somewhat OK. There is a pool table, the laundry pricing is OK (normally a quality sign ), it is decently clean and the restaurant is OK. When they do the room, 6 employees show up. When Astrid asked the Manager to have the beach cleaned, actually 2 guys showed up, to our utter surprise. Just to throw everything back into the sea. 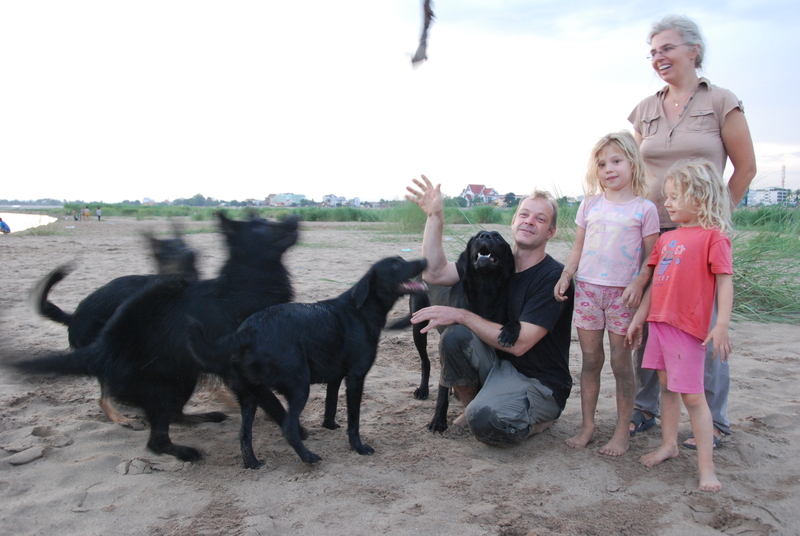 Astrid got quite agitated and explained them with a lot of patience what can stay on the beach and what is actually garbage and has to be taken out and put into a bin. It was funny but in a sense also very sad. We got asylum on the neighboring resort “First Villa”, we often eat there and are allowed to use that pool and WiFi. We’ll move on once our 5 days are over. We actually would stay in “First Villa” but there is no snorkeling here and it seems there are better places on this island. The girls were really sad they had to leave Michaels Zoo. After Vientiane we used the entire Lao train rail in existance. Just 15 Minutes to cross the boarder. Then one has to change trains. The night train to Bangkok was quite nice, especially compared to the Vietnam Version. 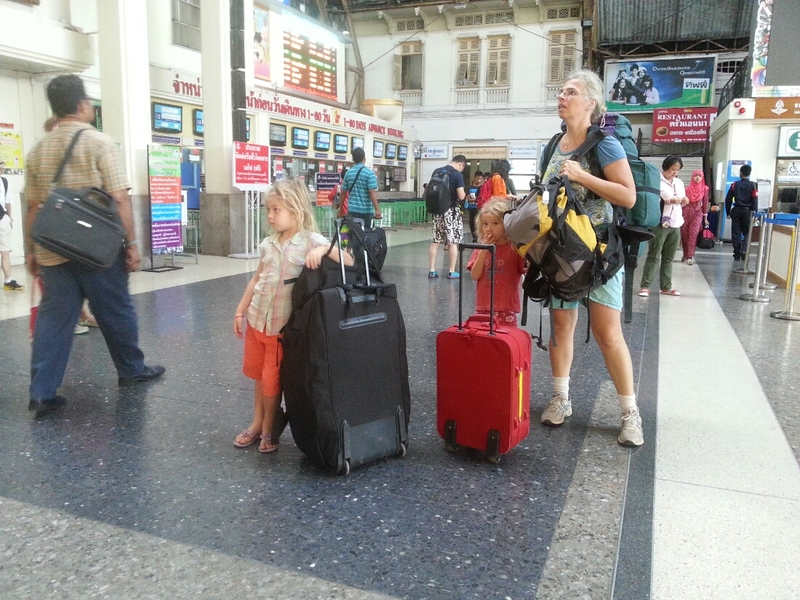 I Guess not many families arrive in Thailand by train. This might change. We heard the chinese want to make a train from Singapore to China via Lao. After a day in Bangkok with some Wats we flew to Koh Samui. We now also booked our flight back to CH. That was also a strange experience. Anyway, we’ll be Back in CH 26.7.2013. Before we go there we are gonna spend 1 week in Oman. Not another Wat, just our Hotel. Astrid erklärte Ada gerade, warum der tschechische Aschenputtelfilm (dieser Film ist daran Schuld, dass jede schweizer Frau das Gefühl hat, sie könne sowohl ein Lausmädchen sein, als auch den Prinzen kriegen) mit den Schneeszenen, einer der schönsten Filme sei. Michael is a tuk-tuk driver in Vientiane. We were honored to stay in his large beautiful house with his 4 big dogs Barolo, Baghira, Taiga and Mira and a whole bunch of other animals. Heaven for the kids. 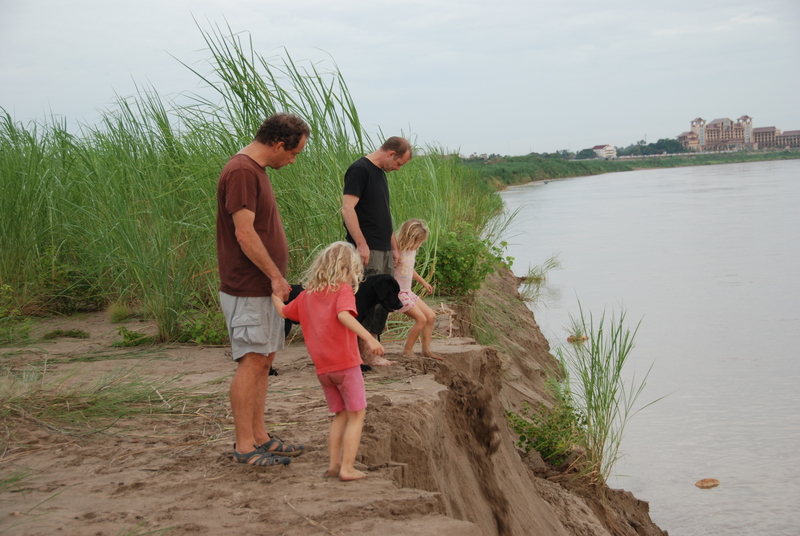 Daily highlight for Ada was the stroll by the riverbank of Mekong at 17:00. The water level rose daily, it is rainy season, the last evening we could launch avalanches. After about 2 days Ada started bossing around the dogs and they happily obeyed her. Even Lena lost most of her fear and petted here favorite, Barolo. 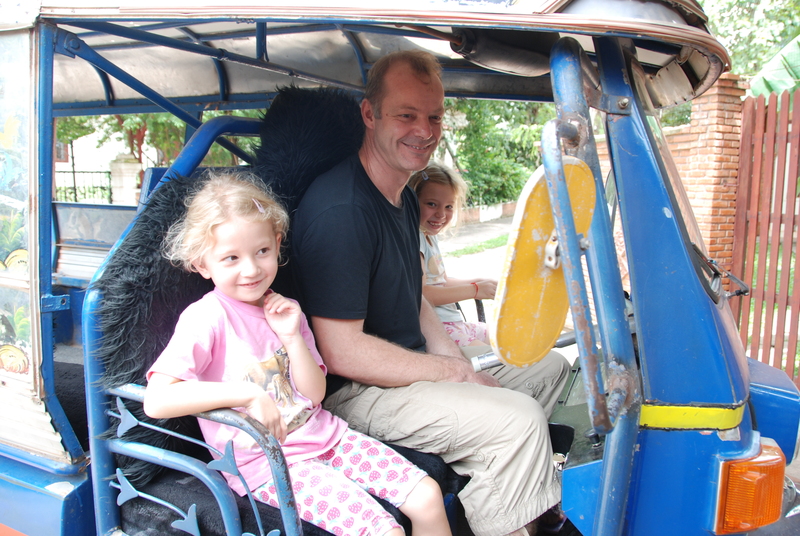 Of course, Michael is not really a tuk-tuk driver, he just owns one. We now go to Bangkok by night train and then proceed to Koh Samui (booked until here), an island in the south of Thailand. We may also change to one of the other islands around there. After 14 days or so we’ll go back to Bangkok for a few days and then fly to Muscat for 7 days. Planned day for arrival back in Switzerland is 26. July 2013. 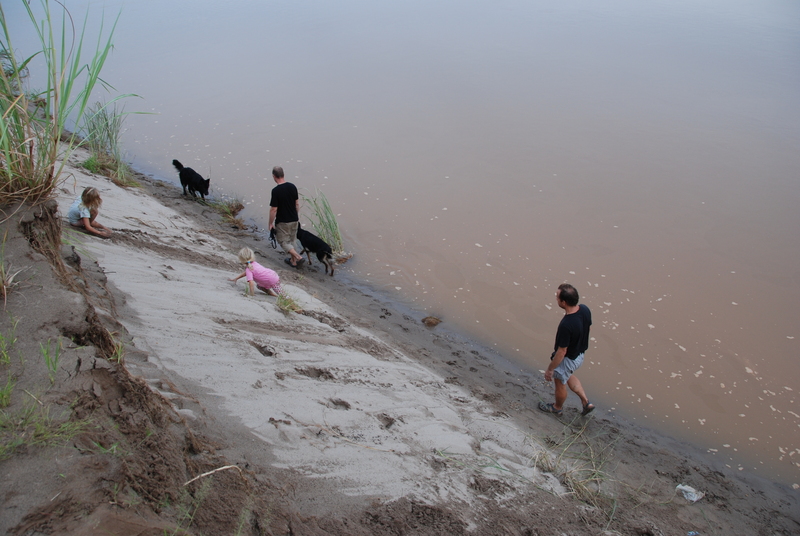 PS: someone told me that the pictures from the riverbank look very dangerous. We were not at all aware of that. The river below is shallow and flows quite slowly. Not very dangerous. Just before we left the Tages Anzeiger (biggest Newspaper in Switzerland) had two Articles Der Party-Fluss des Todes (Party river of death) and Die tödliche Touristenattraktion in Laos (Deadly tourist attraction in Laos). Written after a guardian article Vang Vieng, Laos: the world’s most unlikely party town was published. The article says that at least 27 travelers have died in 2011 tubing and partying in Vang Vieng. Actually wikipedia says 22 dead people. Such discrepancies usually mean that no one cared to check the figure. I think it is as BS as most of the article. Both are very far from the truth. 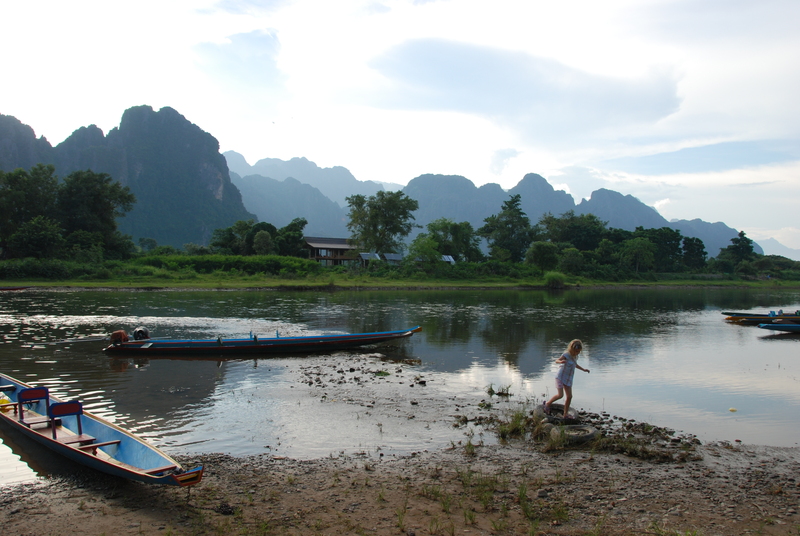 If Vang Vieng is deep in the jungle than Nam Nern (See Where the Tigers are) is on the other side of the Moon. The main roads where paved years ago and the road to Vang Vieng is a pretty big road. Anyway. Before we arrived here, we heard rumors that the tubing was closed. Not quite true. (for the truth see the end of the wikipedia artikel). So we just had to do it. With the kids of course. And not enough. 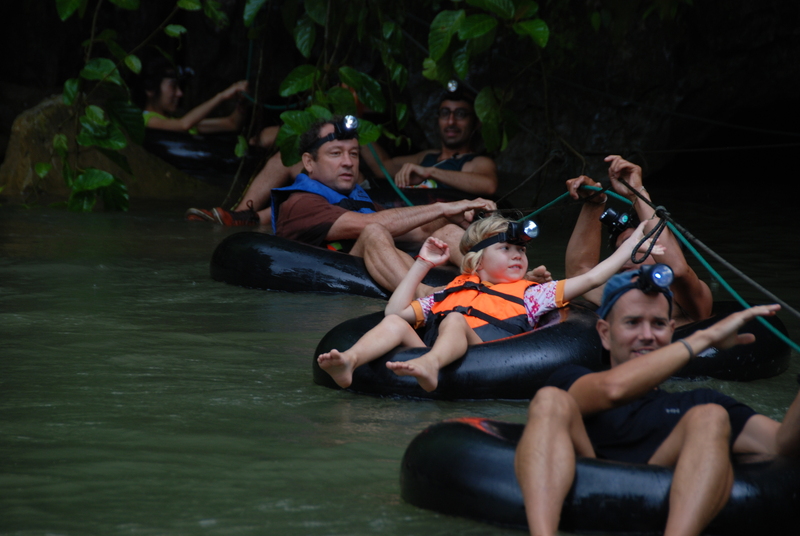 We also booked a cave tubing to begin with. Then it started to rain and it rained the entire night and was still raining in the morning. So we were on the verge of calling it off. There was no way to get the money back and the rain almost stopped. So we decided to give it a try. We were plagued by visions of sudden floods and drowning. But they had the promised life vests perfectly fitting Ada and Lena. The track to the elephant cave where the tubing cave is was slippery and very wet. Finally only Ada and I did the tubing cave (Thamnam Cave). 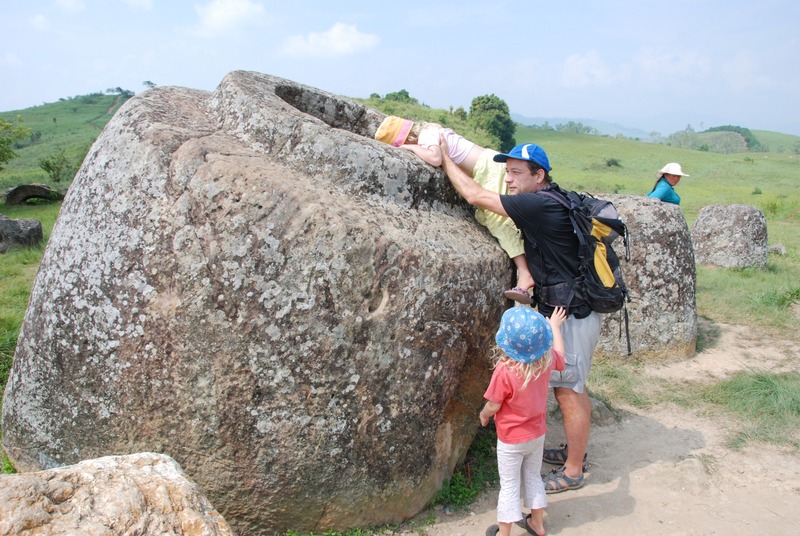 The Guide took Ada’s tube with his feed and pulled here into the cave followed by Papa. 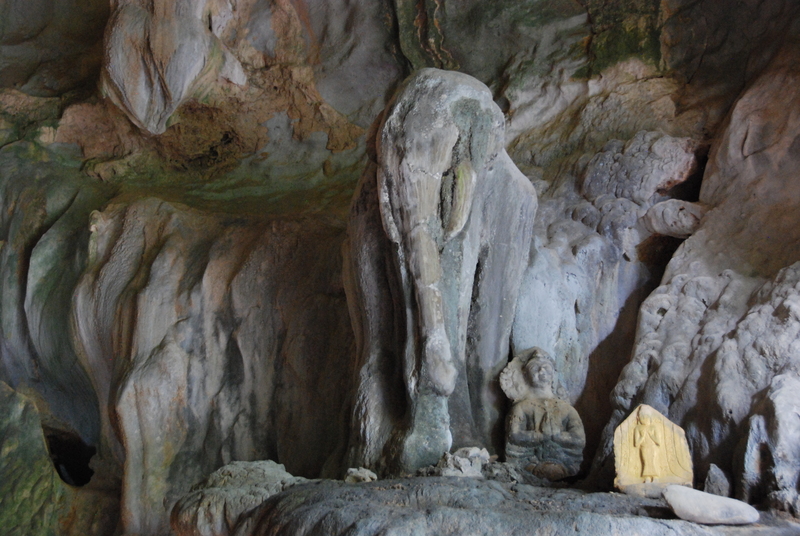 The entrance is quite small but after that the cave is 1 m high and 4 m wide. Actually piece of cake, especially because the more difficult part could not be done because of high water level. One pushes up the stream by a rope the way out is just floating. Back to the Nam Song river (Nam actually means river) after lunch and some drive we came to the start for the tubing. They did not have a small tube for Ada, so they constructed a seat for her with ropes. Lena was on the Kayak with the guide. And then they came. A Group of young chicks with beer in their hands and no life vest. Honestly though, if not drunken a life vest is not necessary for that trip. Even with some high water, it was quite harmless. Then we glided down and had a wonderful trip. I was not once afraid for the live of my kids. Despite all visions. We survived this long trip quite well. Back on the main tourist track. Even found a hotel where one can go to the toilet without getting wet feet. 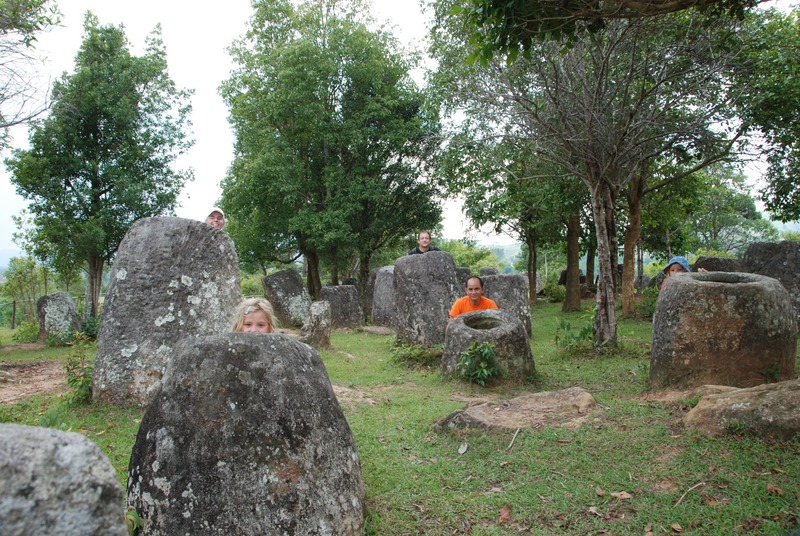 The main attraction in whole north Lao is the Plain of Jars. Truly marvelous. We visited the Site 1, 2 and 3. There are over 90 sites, but some have but 1 jar. 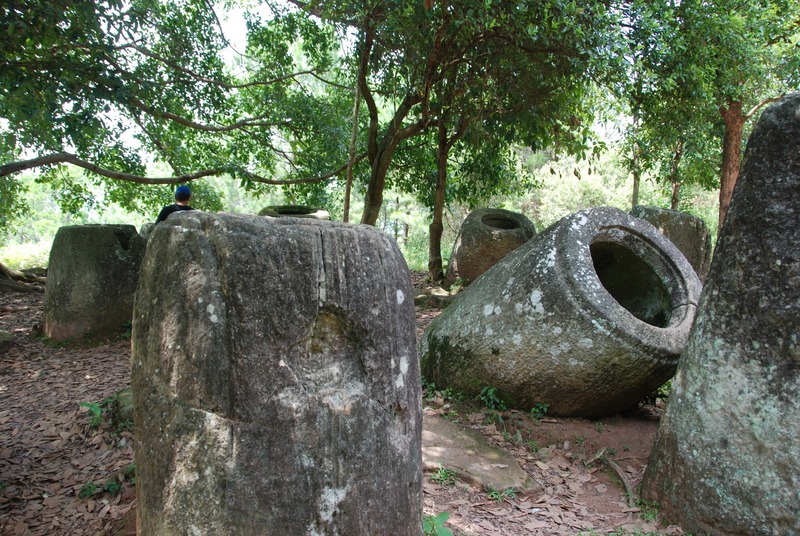 For 2 month now we believed that the plain of jar is, well a plain with jars. That is not the case. Most sites are on top of small hills or in the case of site 3 on a ridge. The entire region is not really a plain. 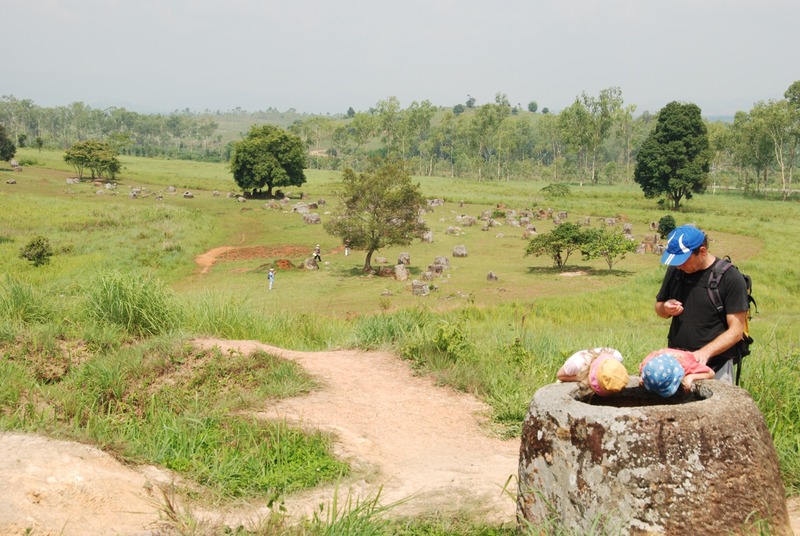 Compared to the rest of Lao it is a plain, about as hilly as for instance Appenzell. Nobody knows for sure what they were made for. We were surprised on the variety of style and forms they have. They are cylindrical, round, almost cubic, conical, irregular; they have a rim, no rim, inside rim, outside rim; are rather raw on the inside or smooth, thick walled, thin walled, almost hollow, just a fraction hollowed; have round, elliptical, square or rectangular (up to 1:2) openings; are made of sandstone, granite, conglomerate, limestone and breccia; are very big or rather small. The smallest were stolen. Very few have lids but none were found in place. The only lid with a carving we found. Find Astrid, Ada, Lena, Thomas, Phong (the driver) and 45 jars. 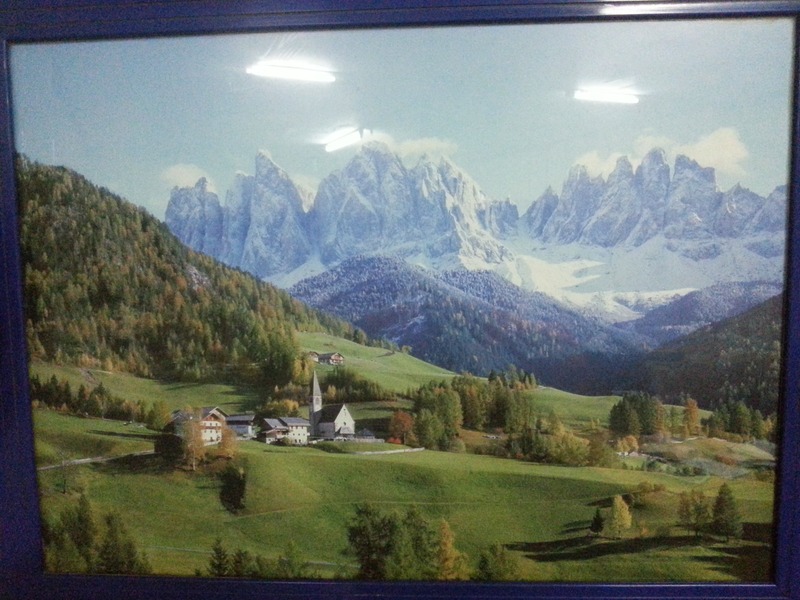 We saw the following picture in and Indian restaurant here.